I just looked at my blog for the first time in over 4 months. That might be the longest stretch without a post since I've had an internet connection fairly regularly... and before then I would drive to the library or somewhere and bum off of the free ones so probably even longer than that! Well as you know, my last post was about whether or not to go private. At this point I'm not going to go private, but it isn't out of the question. The post before that I believe I announced that I got a job. Lots has taken place since then and so I'll try not to be too long winded as I try to catch ya up on all the crazy stuff that has happened. I think I'll list them out and then talk about them a little about them since some of them are a connected to each other. 4. 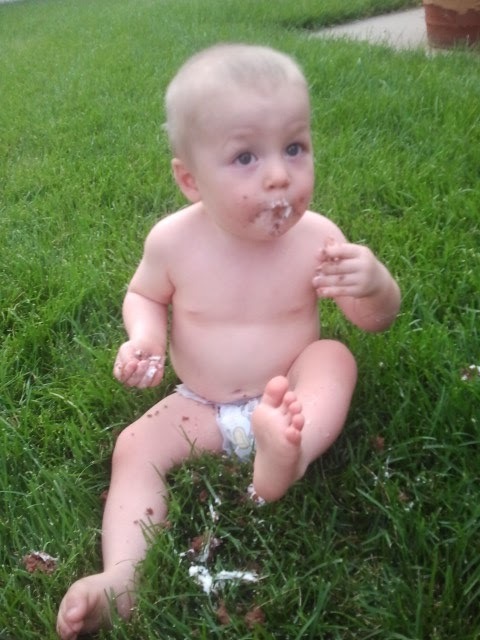 Dax is 1 year old now! 5. Luke is finally potty trained! Wahoo! Ok, well #1 is basically because of #2. My job was a night job from 9:30pm - 2:00 am. I would get to bed around 3am and then my kids would get up around 7. When I wasn't pregnant, I would wake up exhausted and dread getting out of bed but I would do it and go about my morning, nap when the boys napped and then have a normal afternoon. Anyway, I would eventually drag myself out of bed to go throw up empty stomach nothingness and then get Dax out of the crib and get my boys a real breakfast. I would then bathe them, clothe them, and then close their bedroom door and lay in front of it. They would terrorize their bedroom and I would lay there feeling miserable with morning sickness and tired from lack of sleep. Around noon I'd put the boys down and finally take a nap, cursing the stupid dog down the street if it barked and woke me up... which it does quite frequently. After nap time I would still feel sick and lay around. It was not a pretty time. I didn't make food. I didn't clean hardly at all. My poor husband was trying to do everything. Then I'd muster up the strength to go to work. I told my manager before I started getting sick that I found out I'm pregnant and with my last two pregnancies I was very sick and it always got worse at bed time and asked if there was a leave of absence I could take. He said no but that if I tried my best they'd work with me. So if I wasn't too sick I'd go in to work and do my best and if I felt like I was going to throw up I'd go to my manager and say "I've gotta go." He'd say, "ok" and I'd go throw up in the parking lot (not everytime, but... more often than I meant too). This went on for probably a month. I was so miserable and unable to keep up with everything. One morning, I woke up with a little cramping. It wasn't accompanied by spotting or bleeding and it wasn't very strong cramping, but it lasted long enough to worry me and make me call my women's center to make sure there wasn't reason to freak out. Tyler and I talked about it that night and over the weekend that followed and we decided that I was pushing my body to do too much. We figured it was a message from my body saying that me working nights was too much for my body and I was only a couple months along so we didn't want to cause even bigger problems in the months to come. My manager told me I'm welcome to come back after I have the baby and that is a blessing to have that option in case we need it. 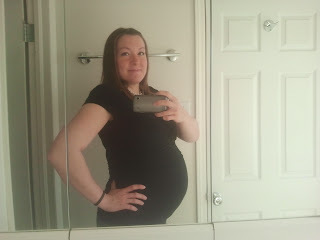 I'm 13 weeks along now and the morning sickness is not as strong as it was and I have more energy to do the things around the house that I need to. I'm still having a hard time keeping caught up and even harder time finding something to make for dinner, but it's still progress. I'm due April 17th and I can't wait to find out what this baby is. Tyler says if it is a boy it will be perfect for making a Tee time to go golfing when our boys are older because they will have 4 and not end up with any random people in their group. I'm hoping for a girl this time but I love my boys and would be happy with another boy if that's how it is supposed to be. On to item number 3. Tyler started electrician school in September... which was also a complication with my work because his class is supposed to get out at 9:30 and I was supposed to be at work at that time... and our boys were supposed to be asleep. His class kept getting out early so it was ok but it was just more stress. I'm very glad Tyler has started school, but it makes it so I hardly see him at all these days. He has been working late everyday for weeks. 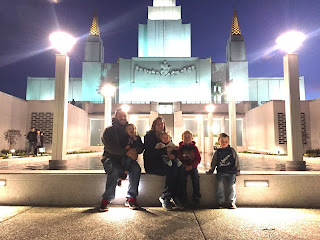 It is great that they have so much work and that he is getting overtime, but on his school days twice a week I don't see him until after 9 most nights and the boys are asleep already so they don't get to see him at all those days. When I was still working I'd pass him in the drive way on my way to work... then not see him until after work the next day. We'd start talking about things we had coming up and it was as though we hadn't talked in a week or two. Especially when he went out of town for work one weekend! I was sad that my morning sickness kicked in before Dax's birthday. 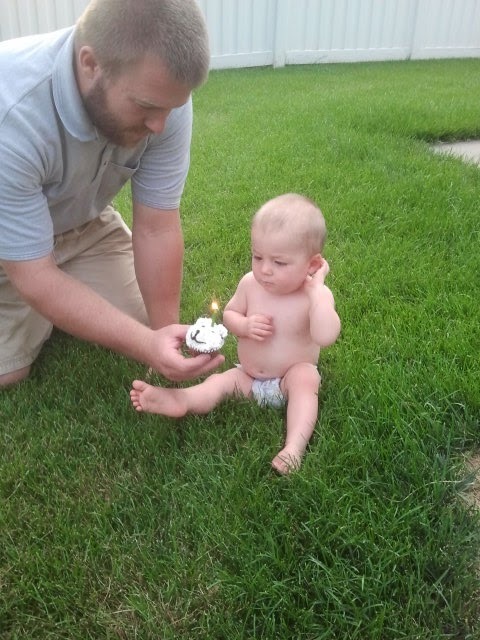 He turned one year old on August 21st and we had two parties. 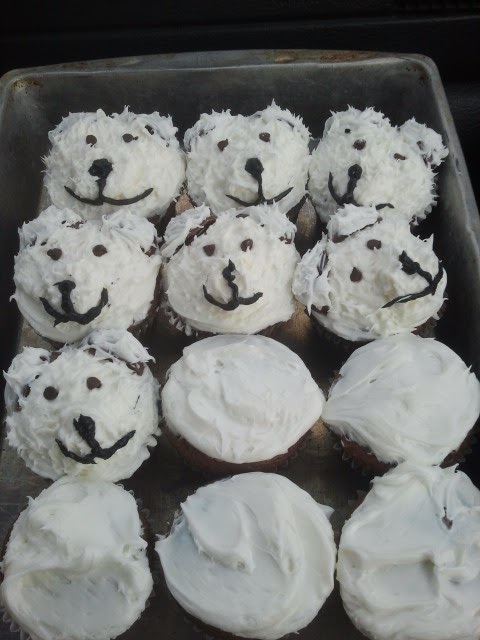 The party we had with Tyler's family I felt good enough to make teddy bear cupcakes... well I felt good enough to make some of them into teddy bears. Tyler helped by frosting them so I could focus on decorating them. Birthday cupcakes in mostly a birthday suit. 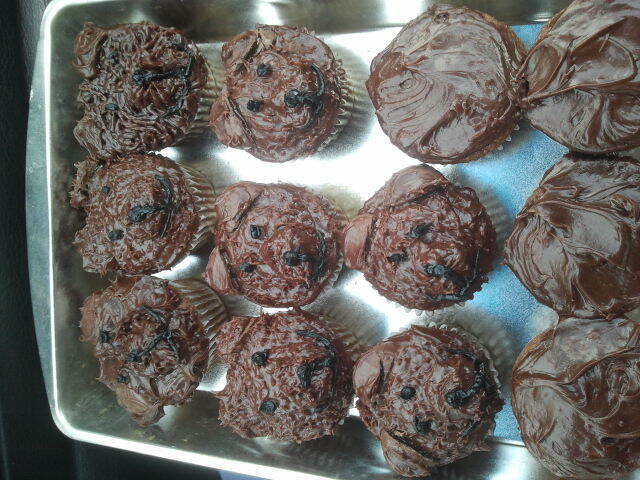 I must say... they turned out really yummy. 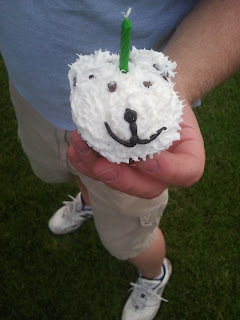 When we had Dax's birthday party with my family... I was not having a very good day. Tyler ran to the store and got some fun toy story cupcakes. I don't have pictures of the occasion... I need to steal them from my dad. 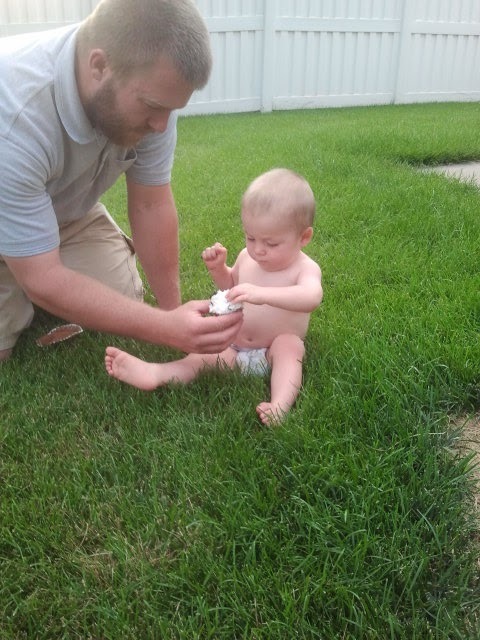 Finally, It has been a few months now, but Luke finally caught on to potty training. We took a trip to Lake Powell in July with my parents and Luke ran around the beach in just swimming shorts most of the time. I tried taking him to the port - a - potty because he would ask to try it after his little cousin would go to it but he didn't really want to. When we got back home we told him he was a big boy and didn't wear diapers anymore. He actually took to it very well and we haven't had to go back this time. I am having a difficult time getting him to go before he can't hold it anymore though. Any suggestions? I try to get him to go often because he waits and waits and then he pees a little, then stops himself and runs to the potty... so I'm having to wash a ton of underwear all the time. It is frustrating and I don't know what to do about it because even if I tell him to go he still does it. It's like even if he thinks about going potty he accidentally lets a little out before he gets to the potty. Suggestions from anyone who has gone through something similar would be greatly appreciated. So that's our last 4 months in a nut shell. 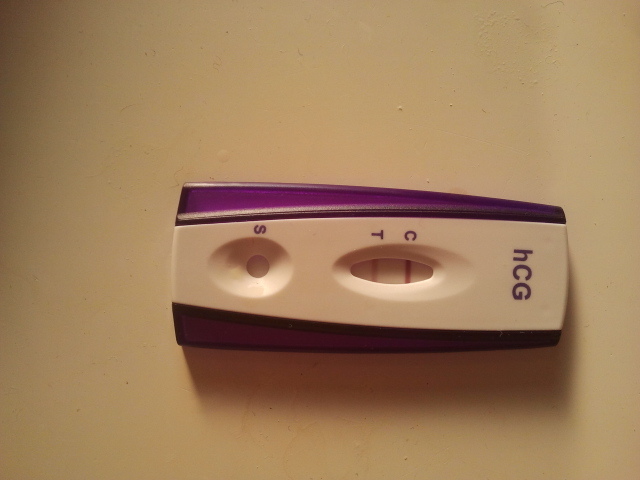 We're really excited to be pregnant again and feeling more of that excitement as the morning sickness goes away! Yay for baby Sargent #3!